To foster and facilitate recovery through therapeutic relationships. In a psychiatric inpatient setting, mental health problems are defined within the physical constructs of an ‘illness’ leading to a system that focuses on problems and lacks messages of recovery1. National reviews of inpatient mental health wards routinely criticise services for a lack of meaningful approach to services, engagement, and empathy from staff1-3. "We can forget stuff in our memories, be preoccupied with life now, like when you're in a bad space, but when you start to talk about culture and heritage, [it] reminds you that you can pull back on those certain strengths.. it's uplifting"
‘Tree of Life’ is a psychosocial support tool based on Narrative Therapy for facilitating personal recovery5. It was developed in Zimbabwe to support high-risk children affected by HIV/AIDS, poverty, war and conflict in Eastern Africa5-6. The approach seeks to minimize stigmatizing narratives by focusing on strengths and resources first before addressing problems. In UK acute mental health wards staff is often viewed as being too busy to talk to patients, under-resourced and rely on medication as the only intervention on wards1. The custodial nature of the wards in the absence of positive therapeutic interactions leads to cycles of conflict within staff and service user relationships7. Negative perceptions of staff and service users’ views reported from people following discharge who did not find their inpatient care helpful in addressing their mental health problems; are well documented8-10. There have also been concerns cited by The Equality and Human Rights Commission11 regarding equality and diversity disparities for Black and Minority Ethnic groups within mental health services. 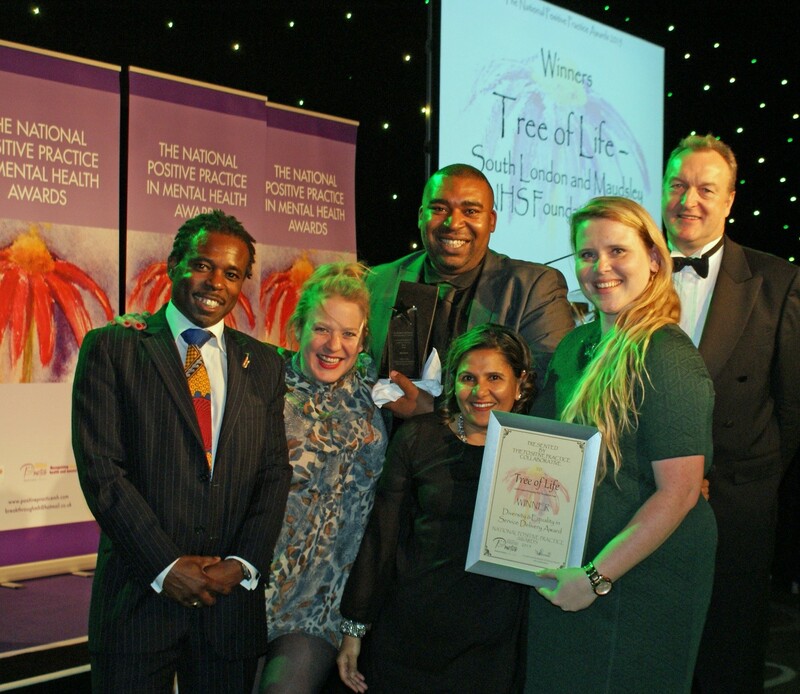 The Tree of Life innovation aims to offer a multi-cultural talking treatment that addresses the needs of an ethnically diverse population while building positive and collaborative relationships between staff and service users. Ultimately helping to promote collaborative recovery approaches to mental health care. Tree of Life workshops embody participative activities that involve drawing trees in a group setting with the aim of building a forest of trees together. Each part of the tree is a metaphor for specific components of an individual’s life that define their identity (relationships, strengths, values and hopes for the future). Within the tree of life model, culture and heritage are recognized as resources, thus making the tree of life a practice that can be valued by diverse communities and services. It has proven successful in its flexible approach and adaptability and is now used internationally in a variety of contexts12-14. Following the Tree of Life Project in 2013-2016, an extensive mixed-methods evaluation demonstrated the interest and benefit that staff and service users gained from the Tree of Life groups on inpatient wards. The positive feedback serves as a key driver of the implementation and sustainability of the groups going forward. Every aspect of the Tree of Life workshops involved a psychologist and service user collaborative approach. The commitment and investment in adhering to this way of work opened up new possibilities for challenging traditional views of therapeutic relationships on the wards and supported the engagement of staff and service users in the groups. Due to staff responsibilities and tasks requiring staff attention on the ward, staff members found it difficult to allocate the time to attend Tree of Life groups. Consistent funding is a key requirement in order to attain service user facilitators who will be running the groups. Uncertainty regarding funding and flexible payment methods make it difficult to predict and/or reassure service user facilitators of their position in the project. The Tree of Life workshops are implemented within the South London and Maudsley (SLAM) NHS Trust through over 15 different teams and services and have been running with the SLAM Recovery College since 2013. Due to the success of the project on the wards, the SLAM Executive Board have recommended that Tree of Life groups run across all 20 adult mental health acute wards and be considered a priority for the psychosocial model of care on inpatient and patient intensive care unit wards in 2018. The Tree of Life groups were evaluated through both quantitative and qualitative methods. The Maudsley Charity provided a total of £150,000 to the SLAM Recovery College for two years of programme implementation. Staff reported in qualitative interviews that the new narrative was integrated well into ward rounds, staff handovers and risk management discussions. The project was also mentioned and discussed on a BBC Radio 4 feature on Recovery in Mental Health in the ‘All in the Mind’ programme. Crisp N, Smith G & Nicholson K (2016) Old Problems, New Solutions – Improving Acute Psychiatric Care for Adults in England. The Commission on Acute Adult Psychiatric Care. The Sainsbury Centre for Mental Health (2005) The Neglected Majority: Developing intermediate mental health care in primary care. London: SCM. Schizophrenia Commission (2012) The abandoned illness: a report from the Schizophrenia Commission. London: Rethink Mental Illness. Brown R et al. (2016) Creating ripples: towards practice-based evidence for narrative therapy within NHS contexts. Clinical Psychology Forum, 284: 48-52. Ncube N (2006) The tree of life project. International Journal of Narrative Therapy & Community Work, 1(3): 16. Ncube-Milo N & Denborough D (2007) The Tree of Life Manual, REPPSI. Bonsack C & Borgeat F (2005) Perceived coercion and need for hospitalization related to psychiatric admission. International journal of law and psychiatry, 28(4): 342-7. Thornihill H, Clare L, & May R (2004) Escape, enlightenment and endurance. Anthropology and Medicine, 11: 181-200. EHRC (2015) Is Britain fairer? The state of equality and human rights. Equality and Human Rights Commission. Byrne A et al. (2011). A powerful piece of work: African and Caribbean men talking about the ‘tree of life’. Context, 117: 40 – 45. Hughes G (2014) Finding a voice through ‘The Tree of Life’: A strength-based approach to mental health for refugee children and families in schools. Clinical child psychology and psychiatry, 19(1): 139-153. Jamieson A (2012) A case study exploring the use of the tree of life as a narrative intervention tool with a black adolescent girl who was sexually abused in South Africa. Unpublished dissertation. Creating ripples: towards practice-based evidence for narrative therapy within NHS contexts. Collective narrative practice in forensic, mental health. Journal of Forensic Practice.